A Boolean that specifies whether to reset the timestamp of the output signal to zero. True Sets the timestamp of the output signal to t0 if t0 is available, and resets t in formula to zero. False Does not set the timestamp of the output signal to t0 if t0 is available, and does not reset t in formula to zero. 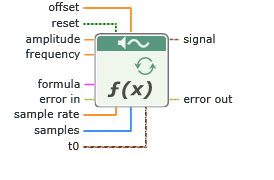 Representation used to generate the output signal. The following table lists the defined variable names and their definitions.